There’s an argument that Sunday is Fulham’s biggest day of the season. With so much at stake, we felt it would be wrong to not delve into the full details of what’s going on in the two games that will determine the promotion aspirations of our beloved football club. So we decided to give you the full whammy – a double salvo from both George Singer and Jack J Collins to fully explore everything going on this Championship D-Day. 1) The Briar Rose, 25 Bennett’s Hill, B2 5RE – Fulhamish’s favourite Wetherspoons in Birmingham, the Briar Rose is a Dom Betts-approved drinking location, and will be sure to house plenty of both sets of fans in the immediate run-up to the game. You’ll find us in here on Sunday morning. 2) The Shakespeare, Lower Temple Street, B2 4JD – Just across from New Street station, the Shakespeare is a favourite for away fans from all over the country. It’ll be open from 10am serving the usual range of food and a real decent breakfast menu at very reasonable prices. Here it is – the 46th (and hopefully final) game of the Whites’ season. At 2:30, the final whistle will blow at St Andrews, and Fulham will know whether their next game will be a play-off showdown against 6th place, or in the promised land of the Premier League. We’ll be lining up against a Birmingham side who know that a single point will guarantee they won’t join Sunderland in League One next year. So, what can we expect to see from the Blues? Since taking over from Steve Cotterill, Garry Monk has preferred a back-to-basics approach. He’s mostly used a classic 4-4-2 in recent games, providing an upturn in results and performances recently. The formation allows them to play their direct, yet fairly attractive, brand of football. Their little and large strikeforce of Che Adams and Lukas Jutkiewicz are fed by their clever wingers, who also often cut inside and have shots from deep. Their attacking players are comfortable on the ball, and not afraid to dribble at opposition defenders, or run onto dangerous through balls. With 4 main attacking players, ie their strikers and 2 wingers, Birmingham’s central midfield is commonly overrun on the break – often leaving their defence isolated. Whilst they spent lots on their defence in the Summer, with ‘Arry Redknapp buying League veterans Marc Roberts and Harlee Dean, common lapses in concentration in the back four have spoilt strong attacking performances and led to many dropped points. In an impressive attacking lineup, there are multiple Birmingham players which the Whites should look out for. ‘King’ Jota, who we were reportedly close to signing ourselves in the summer, always looked a high quality player and has shown in recent performances that he looks to be back to his scintillating best. However the man in strong recent form, and my man to watch, is the opposite winger Jacques Maghoma. The veteran Congolese has put in some strong performances of late, scoring and assisting in his last two games, and is a danger on the break. His pace and power allow his direct attacking runs to cause havoc in opposition final thirds, and has a mean cross on him. What do Birmingham Need to Survive? With goal difference heavily in their favour, a point is enough to guarantee survival for the Bluenoses; and even with a loss, only wins for both Barnsley and Burton Albion would be enough to send Birmingham crashing into League One. With Barnsley away to Derby County, and Burton travelling to Preston North End; two teams chasing the last play-off spot, it’s likely that the Blues have already done enough to keep themselves in the division for the season ahead. Whilst you can never say never in this league, expect to hear St. Andrew’s roar for any PNE or Derby goals that go in over the course of the game, in the same way that the away end will erupt from any shock news from Cardiff. GS: Of all the teams we could have got in this final (and critical) game, Birmingham away is not the game I’d have picked. They may they’ve struggled around the bottom of the league for most of the season, but they have some real quality players in their ranks, and a vocal St Andrews will get right behind the team. We must have confidence coming into the game, and we know if we play to our abilities we can earn a 24th unbeaten game. In particular, I’m keen to see us overlap on the wings, and make the most of the lack of defensive cover that two attacking Blues wingers provide. In particular, Wolves used cut-back low crosses to their advantage in a recent 2-0 win against the Blues – something that we will no doubt try to replicate ourselves. JC: A trip to what will no doubt be an electric St. Andrew’s as the fans get behind their side in demand of safety is not what I’d have chosen either, but Birmingham’s season has been one plagued by inconsistency and errors. Fulham’s high press and workrate in the final third should force more mistakes from a shaky Birmingham backline, and an early goal would do wonders to settle the nerves in a sold out away allocation. I’m hoping for a returning Matt Targett to cause havoc with Sessegnon on the left, which would work both ways in our favour as we look to alleviate the threat that we know Jota can pose. 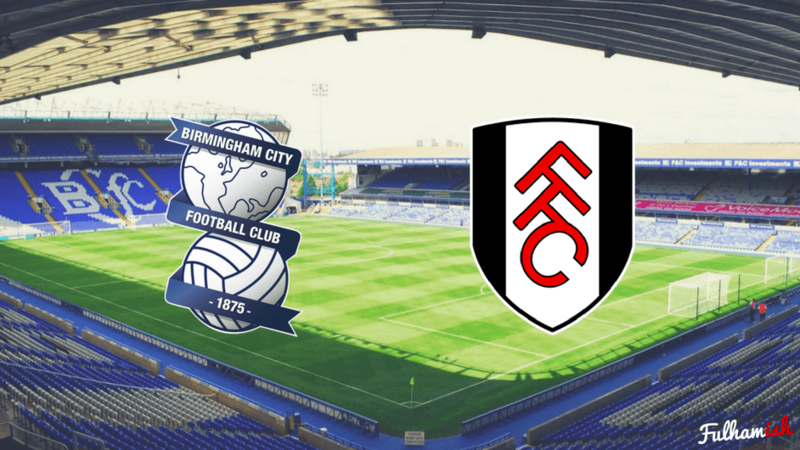 Playing on the overload and forcing Birmingham’s wingers to camp inside their own half seems like a sensible way to minimise the damage that they can cause, and whilst Fulham must be wary, this is a game that we should be able to see through.